These days the standard amenities such as gyms, pools, basketball or tennis courts are not enough. Clients are continually seeking excellence and innovation. How can you stand out from the competition? Find out about the advantages of having a synthetic ice rink at your hotel and how to this will provide your guests with a better overall experience. Boost the guest experience at your hotel by bringing family and friends of all ages together. Our synthetic ice rinks bring people together and give guests a new and exciting activity to enjoy in their free at the hotel. Offer distinctive recreational activities: ice skating, curling, hockey and other interactive games on your synthetic ice rink. Offer on-ice shows: installing a synthetic ice rink not only means that you can offer your guests fun sporty activities like ice skating, but you can add something special to the evenings in your hotel with on-ice shows with professional skaters, lights and audio, creating a memorable experience for everyone. You will attract many more clients to your hotel. Spend more time in your hotel: have your clients spend more time in your hotel, while the youngsters enjoy ice skating, the whole family will end up spending more time and money whether it be in your restaurant, café or shop. Differentiation is key: get your clients to choose your hotel over the rest because of your unique activities and amenities. Having a synthetic ice skating rink as an additional amenity means clients will choose their destination based on your hotel. There are many examples of hotels that have decided to add a skating rink like one of the most luxurious hotels in South America; hotels in the European Alps; or hotels in great cities like Chicago. Their Xtraice rink was the centre point of the annual convention at the worldwide Hilton hotel chain. Over 250 people attended the Hilton Waldorf Astoria Hotel & Resort in Rome, where they installed a 100m2 rink for the event. The rink was also the stage for an on-ice show directed by the FISG (Italian Federation of Ice Sports). The view from this particular hotel is breathtaking considering the proximity to the ski hills, the national parks and the city centre. Their clients could enjoy the rink while enjoying a warm drink and after enjoying a full day of skiing, and the best part is that this ice never melts. The Peninsula Chicago is a luxury five-star hotel and their Xtraice rink returns for its seventh season in 2019. 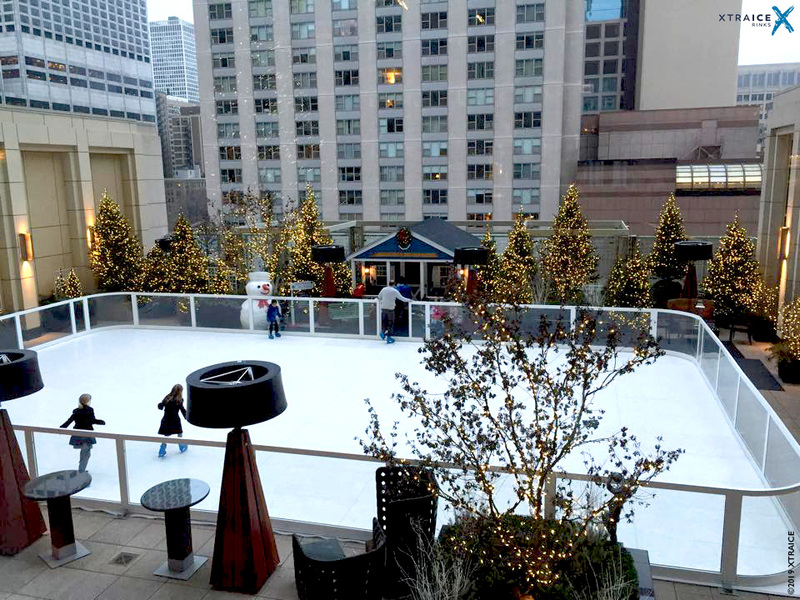 Set on The Terrace, is the ideal setting for the hotel’s seasonal skating rink. Surrounded by Chicago’s skyscrapers and twinkling lights, the rink is tucked into a pine tree winter wonderland and bathed in festive music and snowflake lighting. The luxury hotel located in Punta del Este, installed an ecological Xtraice rink over the winter holidays. See more examples of Xtraice rinks at hotels and resorts.